Imagine your living room as a posh urban penthouse when you purchase a recliner from the Stressless Reno collection. 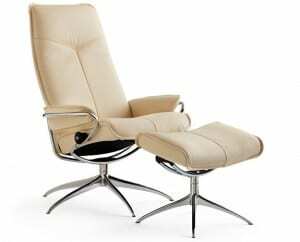 The traditional recliner gains a high-class feel with its smooth leather upholstery, soft curves, and wooden base. From the supple leather seat to the consciously crafted support systems, this chair will add luxury to your living room for years to come. The Glide and Plus™ systems respond to your body’s every move providing maximum support to your neck and back. The Reno (S) is designed to accommodate someone of smaller weight and stature. Smaller bodies need adequate support to relax and release all the tension your muscles hold. The Reno (S) is designed to respond to the subtlest shifts in weight, supporting you in any position. When you sit in a Reno (S), the Plus™ adjusts to fill the space around your spine providing optimal support to your lumbar region. In turn, the Glide system reclines with your body as you lean back, so you relax instead of using your body to push against the chair. The adjustable headrest and ottoman provide proper support from head to toe. Finally, the 360 swivel offers ease of movement. With its smooth cushion, the Reno (S) supports your body and satisfies your desire for attractive furniture. 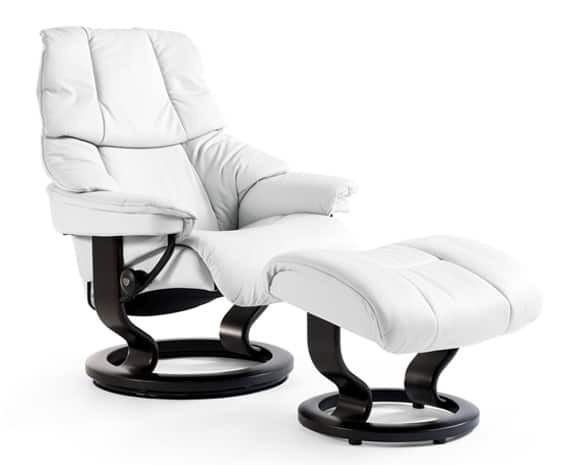 It meets your deepest need for comfort through the trademark Plus and Glide systems which have made Ekornes Stressless recliners famous. We ship to any address in all 50 United States. Ask for details regarding shipments to Canada. For quality assurance, all Reno (S) shipments must be insured for accident, loss, or damage. Once your shipment leaves our facility, a tracking number is provided via email. Unless otherwise stated, delivery means “to your door”. Shipments must be signed for by someone over 18 years of age.